I have never in my life learned anything from anyone who agreed with me. Don’t You Wish You Could Be This Happy? You can! 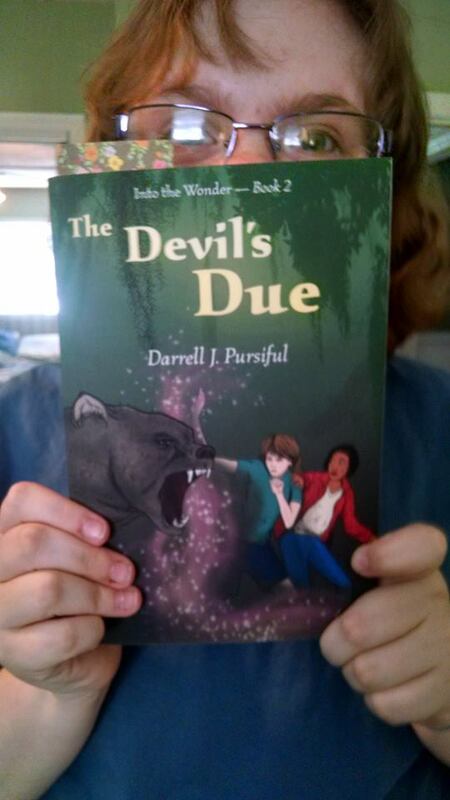 Order The Devil’s Due today! “If you say so,” Taylor said said. She finished her sandwich and put her apple in her purse. Ayoka took up her leather pouch. The two girls weaved up the side of the embankment and off to a wooden structure, a dressing room where athletes prepared for competition. There were trees all over the place. behind the dressing room. Even Topside, this part of the Ocmulgee Indian Mounds was near a wooded marsh. What did surprise her was when she heard someone call her name. There wasn’t another person in sight. “Taylor! Up!” the voice said again. This time she realized it wasn’t a human voice. It was more like the squawk of a parrot or—“A crow?” she said out loud as she scanned the nearest tree. A large black bird sat perched in a branch eight or nine feet up. “Raven,” the bird croaked. It fluttered to a lower branch so it could speak to Taylor face to face. “I’m only…borrowing.” The bird, it seemed, could only speak in brief phrases of two or three words at a time. Taylor was astounded it could communicate at all. But what was it talking about? “It’s me, Taylor…Shanna.” The raven snapped at a passing bug and swallowed it whole. “Trick?” the raven said. “Of course! We say, ‘faring forth.’” “Faring forth,” Taylor repeated. Taylor just stood there, nonplussed. “You look good…. That color…suits you.” There was something sad in the raven’s croaky voice, and also something familiar. Taylor looked at the raven wide-eyed. The first time she met Shanna, she had told her that her true name, the name that powered her magic, was Neunhirri. It was a secret only she and her birth mother shared. There was a long silence as Taylor considered what her mom—or the raven, or whatever—had to say. “Might not find…an animal…that can talk,” the raven said. “How do I do that?” Taylor asked. The raven gave a deep, throaty rattle. Shanna was gone. A second later, so was the raven. When Ayoka re-emerged from the dressing room, she barely looked like herself. She wore a black, fringed skirt and a match- ing halter-top. Around her waist was a wide leather belt with elaborate loops along the edges, top and bottom. Fastened to the front was an animal pelt, turned so the skin part—dyed blood-red—faced outward. On top of everything else, she was covered in war paint—her face, her stomach, her arms, and her legs all the way down to her bare feet were decked out in black and white stripes and whorls. Taylor realized Ayoka was wearing a feminine version of the same kind of outfits the stickball players had been wear- ing earlier. In fact, she clutched a pair of sticks in her hand that rested easily against her bare shoulder. Taylor smiled. She guessed Ayoka knew Shanna had hatched a plan to talk with her, but now she knew it for sure. “Ready?” Ayoka said. Before Taylor could answer, the nunnehi girl strode forward. A line of competitors was forming several yards away. Most looked like teenagers. Older-looking players kept their distance but nodded encouragement to their younger teammates. Among these younger players, some like Ayoka had well-wishers tagging along, older men for the most part, but a few proud mothers were also in the group as well as several other kids Taylor’s age there to support their friends. Taylor followed as Ayoka took her place in line. When she reached the front, she held her sticks over a great stone bowl while an older fae poured water over them from a smaller ceramic cup. As with the previous game, the Ichisi players wore red and the Tsuwatelda black. Both teams huddled around their coach, who gave them a pre-game pep talk that lasted for several min- utes. Then everyone raised their sticks in the middle of the circle and joined in a thunderous war whoop. At last, Ayoka motioned for Taylor to rejoin her. Taylor followed the other supporters back to the playing field, but now she was given a seat much closer to the action, almost on the field itself. The other supporters of the younger Tsuwatelda players found their seats around her. The musicians were still playing and singing, and by now the whole arena was filled with the haunting sounds of the music. A drumbeat rose to a crescendo as the players marched onto the field. It was another half-hour, however, before anybody even tried to settle down and start the game. The music continued to pulse through the arena like a living thing. Taylor felt herself swaying to the music along with everyone around her. Jets of faery fire streamed across the noonday sky, a confusion of red and green and blue and gold. A thousand spectators seemed to become a single organism, wrapped up in the spectacle. Only the guy in the “Wild Hunt” tee shirt seemed unfazed. He sat cross-legged on his blanket apparently unmoved. For a split second, he and Taylor made eye contact, but he immediately looked away. There was something familiar about him; Taylor couldn’t decide what. She picked up her pace as she wandered west toward the river and soon arrived at an open-air sports arena. A thousand or more fans sat on blankets all around a large, flat depression between two mounds. The place was bigger than a football field, with sixteen-foot tall poles at either end. Two teams were going at it: running up and down the field, each player with a stick in each hand. The sticks had little mesh cups on one end, and they used them to carry a little ball back and forth. There were about twenty on a side, and Taylor had seen nothing like them. It was a fast, brutal game. Apparently, you were allowed to tackle the player who had the ball, because players were constantly slamming into each other. They didn’t wear any padding. In fact, they played barefooted, wearing just a loincloth and war paint, with a horsehair tail trailing behind them. But something else was also going on. Occasionally, some- one would lunge at an opposing player, only to have his target vanish into thin air with a flash of light. Then, he would reappear somewhere else on the field and continue his run toward the goal post. At other times, a runner would stop short, magically blasted off his feet by a member of the other team. Or else he changed course unexpectedly as if he saw an opponent rushing him even though no one was there. It was like a non-lethal form of combat, with generous doses of magic added in. She looked up from the game. Ayoka was weaving toward her through the crowd of spectators. “You made it!” Ayoka smiled. She looked like an ordinary teenage Native American girl, dressed similar to Taylor. No sooner had the two girls hugged each other than the crowd erupted in wild applause. The girls whipped around to see one team, dressed in red loincloths, lifting one of its members into the air in exultation. “Uh…right,” Taylor said. Ayoka and her family were visiting from Tsuwatelda, or what Topsiders called Pilot Knob, North Carolina. Taylor followed her friend through the maze of spectators. Ayoka kept one eye on the game, which wasn’t easy when fans jumped up to cheer for their team or complain when they did something wrong. “Not the way anybody plays it.” Taylor winced as two players went down in a flash of crimson light. Taylor noted the oblong wooden finials at the top of each goalpost. “And you’re allowed to use magic?” Taylor said. Just then a player in a black loincloth leaped into the air and used one of his sticks to fling the ball toward the nearest goalpost. It slammed into the finial, which spun around like a weather vane in a tornado. Ayoka shrieked and pumped her fist in the air while most of the fans around her shook their heads. “That’s my cousin!” Ayoka beamed. “I remember,” Taylor said. She had seen Tsisgwa from a distance back in April. Her heart fluttered as the young fae spun and dodged on the field, his bare chest heaving with exertion, a look of fierce concentration on his face. She looked away before she started to blush. They soon found Ayoka’s parents seated near what Taylor would have called the fifty-yard line. A nunnehi man and woman smiled at Taylor. She nodded and took her seat on the blankets they had spread out. Ayoka nodded, then jumped up to cheer something that happened on the field. Taylor had nearly forgotten that Ayoka had just turned twenty-six years old, even though she only looked about thirteen or fourteen. There was another bone-crunching tackle. A couple of players from both teams sprawled on the field. They were quickly escorted off, however, and play continued almost immediately. “And I thought football was violent,” Taylor muttered. “Is football how Topsiders train their warriors?” Ayoka asked. Everyone around her was suddenly on their feet. The Ichisi team was driving toward the goal, the ball in the possession of a giant of a man who muscled through the Tsuwatelda defenders like they were children. Tsisgwa flew toward him in a flying tackle, but the Ichisi player blinked away in a flash of super- heated dust, appearing just outside the no-magic line. Just as suddenly, another Tsuwatelda player blasted him with an explosion of purple flame, and the ball came loose from his stick. Players from both teams scrambled to retrieve the ball. It looked to Taylor like an honest-to-goodness riot was about to break out, when at last an Ichisi player swatted the ball into the cup of an awaiting teammate. This player wasted no time: he flung the ball toward the goal just as four Tsuwatelda players piled into him. The ball sailed through the air for thirty feet and struck the goalpost above the midline. Ayoka’s mom opened a picnic basket and offered both girls sandwiches and fresh fruit: a delicious selection of apples and plums. Ayoka scarfed down her sandwich like she hadn’t eaten in a week. “Sure,” her mom said, digging into the picnic basket. Taylor’s eyes wandered across the playing field, now empty except for attendants smoothing out the densely packed earth and spreading out a fine coat of sand. With the playing field in order, a nunnehi musical group began to sing an upbeat song in their own language. Many in the crowd began to join in. When she turned back around, Taylor saw that Ayoka had finished off her second cookie and was opening a bag of fruity candy. “Oh, right.” Sweet snacks helped to power fae magic. Taylor wondered how many cookies those stickball players had to put away to do the things they were doing. “No, I think I’d like you to go with me.” Ayoka glanced at her parents, the three nunnehi exchanged subtle grins. By the time she came out of her room, the house was empty. It was the first Friday after the end of school. If her best friend hadn’t gone to visit her grandma in Louisiana, she would likely be hanging out with her all day. But something better came up, so it was just as well she didn’t have to worry about Jill. She hadn’t figured out how to let Jill in on her secret, either. She had meant to tell her everything. But how do you explain something like that to somebody who’s been your best friend since fourth grade? By the way, Jill, it turns out I’m a mythological being. Cool, huh? No, she had to find a better way. Ease into it somehow. Maybe she could think of what to say over the Memorial Day weekend. She grabbed a granola bar and a glass of orange juice. She watched a little TV. Then she pulled back her long, straight hair in a ponytail, donned the floppy sunhat she bought at the beach last summer, and headed out the door. She checked the time on her phone. It was a little past eight. Taylor locked up the house and got on her bike. Twenty minutes later, she had reached her destination. The gate at the Ocmulgee National Monument was already open. She wheeled down the park road past the Welcome Center and kept on going. The shadow of the trees kept the heat from feeling unbearable. Birds sang. She had the park pretty much to herself. The Ocmulgee Indian Mounds had been inhabited since prehistoric times. Now, it was a national park in the middle of Macon, Georgia. The park hosted an annual Indian powwow every fall, and a lot of school groups took field trips to the place. Taylor hadn’t been there in a couple of years, but it wasn’t hard for her to get her bearings. In another ten minutes of cycling, she arrived at a small parking lot at the foot of an immense artificial mound, taller than a five-story building. The sign by the side of the road iden- tified it as the Great Temple Mound. A footpath led to stairs creeping up one side. A family with two young children stood at the very top, enjoying the view. She chained her bike to the sign and continued on foot. “Any mound should do,” Ayoka had told her. “Just pick one near the river.” She gazed up at the top of the mound and sighed. It was a long way to the top. She decided to veer off the footpath and head to the Lesser Temple Mound, which was both closer and smaller. She tried to take her time; it didn’t take much for her to get out of breath. Even though she hadn’t had an asthma attack in over a month, she wasn’t ready to take any chances. The family on the Greater Mound above her was no longer in sight. It wouldn’t be long until they reappeared on the path, however. It was time. She took a deep breath and imagined a magical mist surrounding her like a blanket. Danny Underhill had taught her that. Confident she was effectively invisible, she hiked up the wooden stairs to the top of the Lesser Mound. She paused to take in the view. Not only could she see several of the other mounds in the park, if she looked off to the west, across the Ocmulgee River, she saw the buildings of downtown Macon. She checked the time again on her phone. If she left by 4:15 or so, she should have plenty of time to get home before her parents, and they would never have to know she had left the house. But first, she had to get to where she was going. She pulled down the brim of her hat against the glare of the sun. She bit her lip and gazed at the top of the mound, looking for the telltale shimmer in the air. Here goes, she thought. She took another breath as she closed her eyes and imagined a billowing cloud of mist rising from the ground. Without even thinking about it, she gestured with her hand, like a conductor leading a choir to sing louder. And then it happened. A swirling wall of gold and silver lights erupted from the mound, a shimmering circle ten feet across. Taylor suppressed a giggle and plunged straight in. Immediately, she was in a different world. She was still atop the Lesser Temple Mound, but the mound itself was huge— maybe three times larger than it was before. To the west, the downtown buildings were missing completely. To the north, the two deep railroad cuts—one still in use by the railroad and the other turned into the very park road she had taken to get there—were also missing. Instead, a vast, broad plaza stretched out from where she stood all the way to the Earth Lodge a quarter of a mile away. The plaza was dotted with dozens of houses, some ancient and traditional, others more modern. And hundreds of people filled the entire complex! These were the Fair Folk: the people to which Taylor’s birth parents belonged. Most were nunnehi, Native American fae like Ayoka. Some were in traditional dress and others in regular street clothes. Some were white or African American. Some had pointed ears. Others had tails or snake- like eye slits. Some were little folk: dusky-skinned and only three feet tall. Taylor had slipped into the Wonder. None of this existed Topside, of course, and nobody Topside had any inkling that a whole other world existed right under their noses (although Native Americans told stories of “spirit warriors” who sang and danced at the mounds). In this version of the Ocmulgee Mounds, in the town of Ichisi, there was no city just beyond the trees. Everything was wild, untamed. Free. She looked up into the sky. As expected, the hue was more turquoise than the blue it had been Topside. The air was filled with the smells of exotic foods and the hubbub of conversation. In the distance, fans cheered some kind of sporting event. That, she knew, was her destination. Taylor came down off the mound and made her way through the crowd toward the sound of cheering. From inside the open doors, she saw women cooking untold delicacies in huge copper cauldrons. Young children ran willy- nilly through the streets, laughing and playing. A couple of men were haggling over some sort of magical implement. Oth- ers, both men and women, had stopped at the corner for an impromptu a cappella jam session. Further down the street, a teenage fae dazzled a crowd of younger kids by creating rings of colored smoke out of thin air and sending them skyward. A man and a woman—Native Americans both at least ten feet tall—stooped to converse with another fae with an open suitcase filled with a multitude of jars, cases, and vials of multicolored liquid. It was almost more than Taylor could take in. It wasn’t home. It was anything but. Even so, something about it put Taylor at ease for the first time in weeks.